(Dharamsala, 13 October 2014) – The Gyalwang Karmapa today received a group of 30 North American university students, for a lively question-and-answer session. 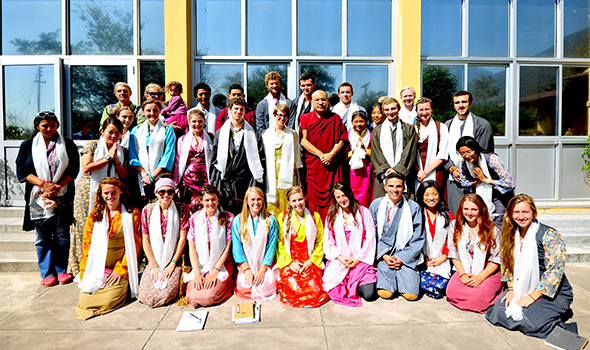 The students’ questions covered far-ranging terrain, exploring topics such as environmental protection, arts and music as part of spiritual practice, conflict resolution, animal rights and his work to bring about full ordination for nuns in the Tibetan Buddhist tradition. The students are visiting India and Nepal as part of the semester-long SIT Study Abroad program, and will spend just over a week in Dharamsala. The students inquired as to whether any progress has been made towards full ordination for nuns in Tibetan Buddhism, noting that this was an issue that His Holiness had been supporting in words as well as deeds. 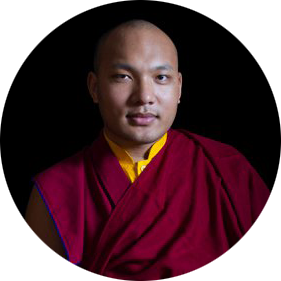 Echoing comments made in the press conference held upon arriving in Europe in June, the Gyalwang Karmapa said that he is optimistic that within a few years, “it will happen.” He said that although some nuns already recognize the value of holding the bhikshuni vows, an important step is for Tibetan nuns more widely to appreciate the importance of receiving full ordination, so that when the opportunity does arise, they should not have any sense of being pressured, but rather themselves eagerly seek to take the opportunity. The students then asked His Holiness about his activities as an artist. “People think I am an artist, but I do not think of myself as an artist,” he said. “But I am interested in art.” He described his painting as part of a spiritual practice, in which the mind calms down, becomes free of conceptual thought, and comes to rest in single-pointed focus on the action of painting itself.